Thirteen-year-old Jack Sillin of Yarmouth writes a daily weather blog that has won nearly 2,000 online followers. YARMOUTH — Every day is a new puzzle for Jack Sillin. Sillin rises at 5 a.m., plops in front of four computer screens and digs into reams of weather data, poring over maps and computer models, all without leaving his bedroom. 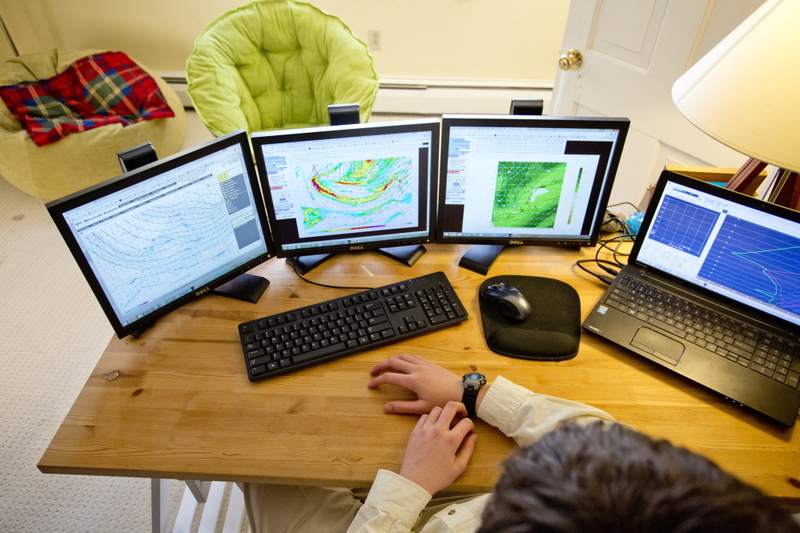 Jack Sillin, 13, is a prolific amateur meteorologist who forecasts the weather from his Yarmouth bedroom every day to nearly 2,000 readers and followers. Comparing National Weather Service snow accumulation data measured at its station in Gray gives an idea of how accurate Sillin’s predictions have become. He also, however, can fall victim to the same tricky weather systems that fool the pros, such as the blizzard that was supposed to sweep through most of southern Maine on Feb. 14 but hit only York and Washington counties instead. Sillin is 13 years old. He has to work fast. If he’s not careful, Sillin could be late for his chorus class at North Yarmouth Academy, where he is a freshman. For the last two years, Sillin has turned his boyhood curiosity into a burgeoning hobby that has drawn nearly 2,000 followers online. Sillin’s affinity for weather started in second grade, said his father, Peter Sillin. But it wasn’t the first time the boy had taken a striking interest in the esoteric. Then, during a plane trip when he was about 6 years old, Sillin was transfixed by The Weather Channel playing on the in-flight screen in front of him. Ever since, it’s been his passion. 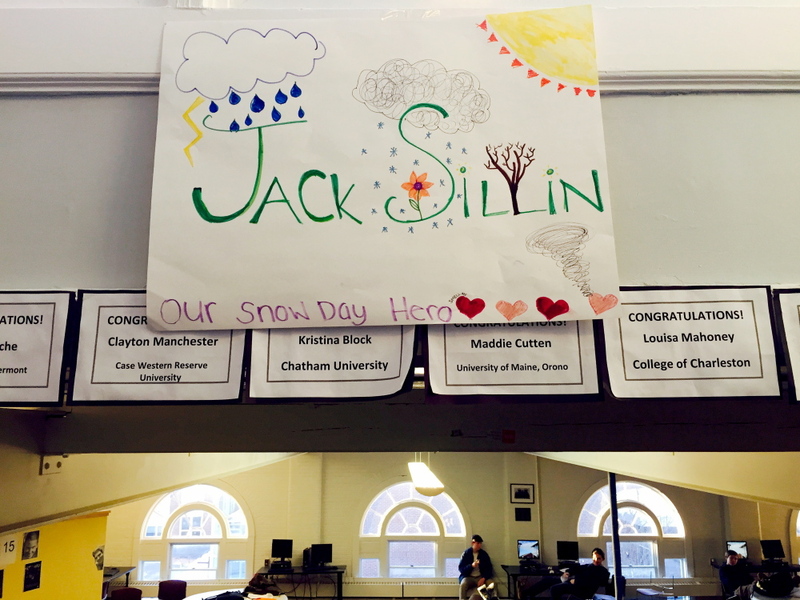 Among friends at school and on his blog, Sillin is known as Forecaster Jack, Snow Day Jack, or simply, Our Snow Day Hero. Teachers and classmates – and even the school’s headmaster – turn to him to find out if there will be school the next day, and how much snow to expect. Often, he’s correct. One classmate, Devlin O’Keefe, who also lives in Yarmouth, said his friend seems almost preternaturally skilled at reading weather information. When classmates ask him about the forecast, they often get an earful of technical terminology. “People say, ‘Jack, English! '” Devlin said. It’s not only his classmates who hang on his weather calls. Nearly 1,000 people receive daily email updates from his blog, Forecasterjack.com, and more than 870 follow him on Twitter. It is likely that many of them have no idea that he is too young to drive or to vote, or order a drink at a bar. The tone and content of his work, complete with maps and graphics, makes it nigh impossible to discern his age. After the new year, for example, Sillin apologized for the lack of updates as if he was a politician making a cordial exit from public life. “I decided to take some time off and spend time with family while the weather was quiet,” Sillin wrote. While younger than most, Sillin is a member of a niche community of amateurs who harness the vast troves of weather data available online and render their own judgments about the coming conditions. 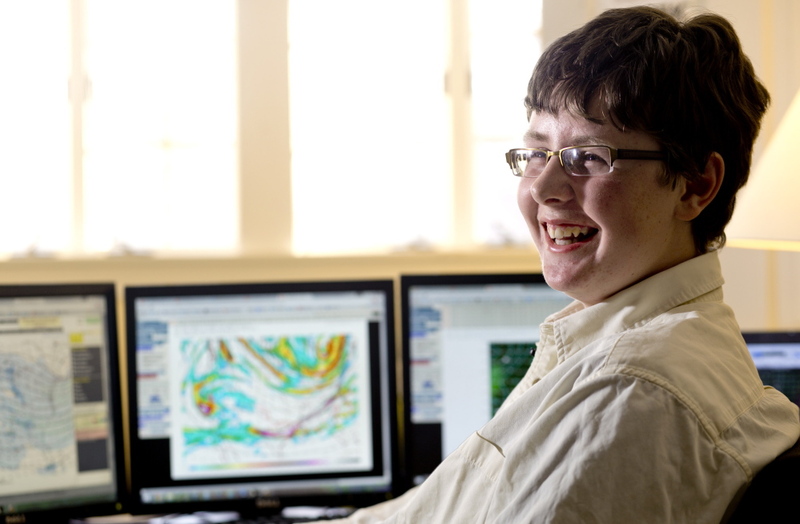 When he started making predictions on Twitter two years ago at age 11, Sillin caught the attention of Mike Haggett of Poland Spring, another weather geek whose website, Western Maine Weather, was taking off in popularity. At one point after Sillin and Haggett exchanged pointed tweets about the forecast, Sillin’s dad reached out to Haggett to let him know it was a precocious child with whom he was arguing. Haggett, who is 45 and the father of a high school senior, talked with Sillin’s father, and through tweets and online exchanges, Haggett became a mentor for the young prognosticator, helping him refine his interpretation of weather data. Haggett said he was at first skeptical, like he is about many young kids who think a single weather model and a few maps make them knowledgeable. Now, Sillin and two other boys his age from southern Maine cooperate with Haggett to assemble daily updates on Haggett’s site. “Thanks, Dad!” Sillin said, his dad sitting nearby, smiling. According to Haggett, Sillin’s hard work is paying off. Haggett helps Sillin and his young compatriots hone their writing and communication skills, without veering into exaggeration or hype. He also shows them how to go into more detailed forecasting techniques. The blog goes relatively quiet in the summer, when there are few storms worth getting excited about, Sillin said. This year has proven particularly fun, he said. Each storm with snow and freezing temperatures is a bonanza for Sillin and others to monitor. His meteorological vocabulary is large enough that Sillin has installed a glossary of terms on his website so his followers can keep up and understand the jargon. “Stuff gets thrown around that might be over some people’s heads, so I try to give people a chance to look them up,” he said. So, still curious about that Norlun trough? Search the term on Google and among the top results, after Accuweather and others, is Sillin’s page. He plans to continue his forecasting hobby, perhaps to turn it into a career someday. Until then, behind banks of glowing screens in the early morning hours, Forecaster Jack will be there, watching the barometer, checking the models, ready to cast his prediction for the next big storm.